A single European energy market will assist economic growth, encourage investment in infrastructure and empower consumers, Energy Commissioner Günther Oettinger writes. Fast action from governments is needed to meet the 2014 deadline. It is somewhat fitting to be writing this in November as the nights get longer and the days get darker. Across Europe people are turning up their thermostats to fight off winter’s chill and turning their lights on in the mornings as well as the evenings. They might also look at their energy bills and wonder why prices are behaving so differently over Europe, whether constantly high, climbing or seemingly so low as to be too good to be true. Governments are being called to take action but what can they do? EU member states have given themselves the deadline of 2014 to complete the internal energy market but they are not on track to do so. 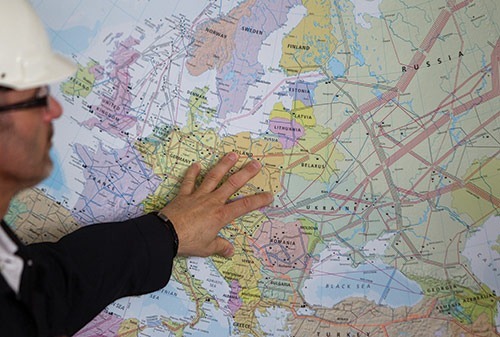 The case for having a common market across Europe rather than 27 individual national markets is clear: a properly functioning market in energy will stimulate competition and keep costs down for consumers and companies alike. How much these two are linked is shown by the following example: Wholesale electricity prices have not risen to the same extent as the import prices for fuels which are the basis for electricity production. While the price for crude oil has risen annually by 14 per cent, for gas by almost 10 per cent and for coal by per cent in recent years, wholesale electricity prices in the EU have risen much less, namely by 3.4 per cent, thanks to increased cross-border trade and market integration. But we are still not finished. Even 19 months after the expiry of the deadline, transposition of the 3rd Internal Energy Market Package is slow and incomplete. This is why I am pursuing infringement procedures for non-transposition and incorrect implementation of the legislation in place: the 3rd Internal Energy Market Package and, after its adoption, the Infrastructure Regulation. Market opening and integration will not happen by itself. The effective implementation of the legislation in place is a necessity. The Commission must be a strong player in ensuring that member states adopt the necessary legislation as energy issues can no longer be seen as solely the responsibility of the member states. With our electricity and gas markets increasingly integrated, what happens in one member state has automatic consequences in other member states. What will the effect be for the consumer? We will ensure that the consumer rights enshrined in the legislation have to be visible in national law and properly respected by all market players: consumers need to have the information and practical means to switch from one supplier to the other in three weeks’ time without any financial costs. Actively communicating these rights is essential. The companies should, upfront, inform the consumers about their rights and the Commission will provide a website with dedicated practical information. But we also need to look ahead: The energy framework of tomorrow and its transition to a low-carbon future poses a lot of challenges. Inputs from renewables, which, by their nature, cannot provide power at all times need appropriate back-up, for example from gas. Some member states are creating capacity mechanisms to provide for their own national power needs but without joined-up working, we risk paying a lot and the market across Europe being undermined. Similarly, a Europe-wide market will be undermined if individual states grant harmful subsidies to their energy sectors. Whilst for the consumer, subsidised energy may seem desirable, it is their taxes that fund the subsidy, so either way they are paying the real cost for their energy. Co-operating across borders on energy is therefore a perfect example as to how the EU adds value to all member states. In the wider economic picture, the internal energy market is not an objective in itself, nor is reform driven solely by our goal to reduce greenhouse gas emissions by 80-95 per cent by 2050, but it is a significant expedient in delivering key EU goals: economic growth; jobs; secure coverage of basic needs at an affordable price; and sustainable use of limited resources. Without considerable changes in the functioning of the energy market, we will face a less reliable and more costly European energy system, declining EU competitiveness and wealth, and slow progress towards decarbonisation. Investing in generation, transmission and distribution infrastructure and storage, and implementing more efficiency measures will deliver growth and jobs and boost economies across Europe. 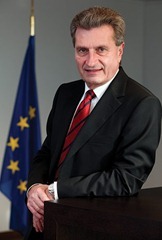 Günther Oettinger has served as Energy Commissioner since 2010 and was previously Minister-President (equivalent to First Minister) of Baden-Württemberg, in south western Germany between 2005 and 2010. He is a member of the centre-right Christian Democrats and has a background in law, audit and tax consultancy.